It's my friend's 30th birthday today and I'm flying out to San Diego as we speak to help her celebrate this weekend! I didn't want to risk making a cake or cupcakes and having it confiscated at the security check point; so, I decided on something I can easily pack into my carry on bag, sugar cookies. 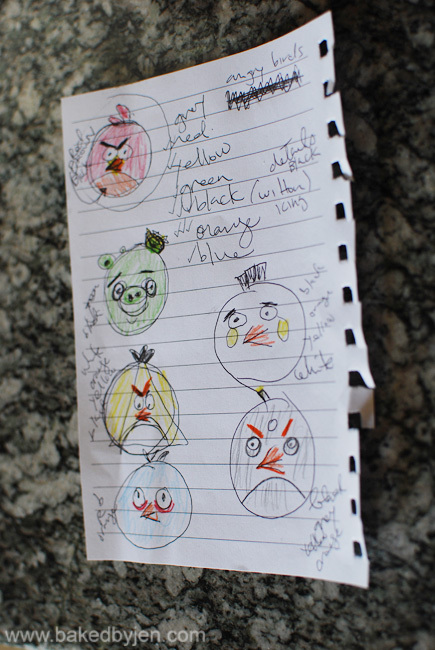 She is as addicted to the Angry Birds game as I am so I knew this would be a cute and fun gift. After sketching out the images and writing up the schematics, I got a bit nervous with how much work it would be for me. 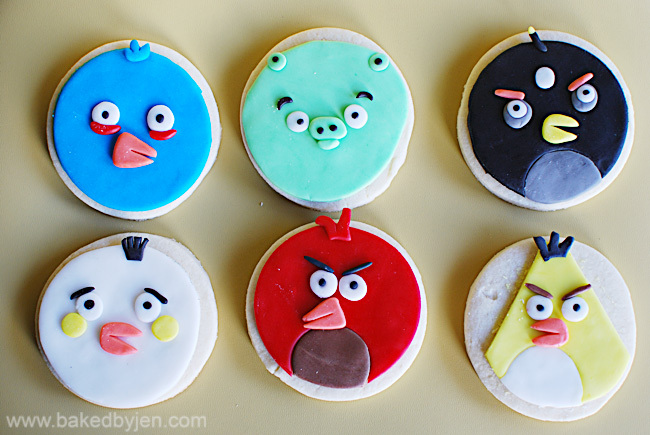 My sugar cookie decorating skills are very limited. 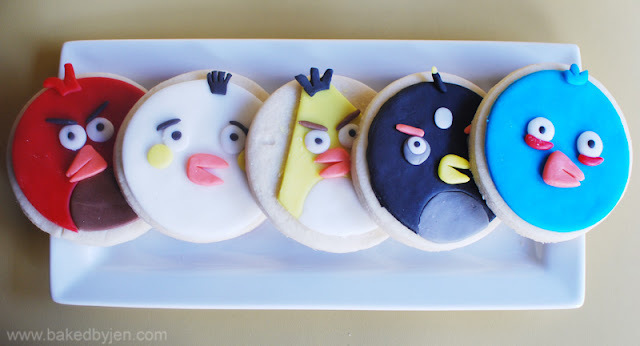 But then, I realized that I could just use fondant! Having never tasted fondant on a sugar cookie, I definitely made sure that these cookies were nice and thick. I even found the greatest way to measure the thickness of the cookies; I rolled the dough out in between two chopsticks I had laying around which measured 1/4 inch thick exactly! 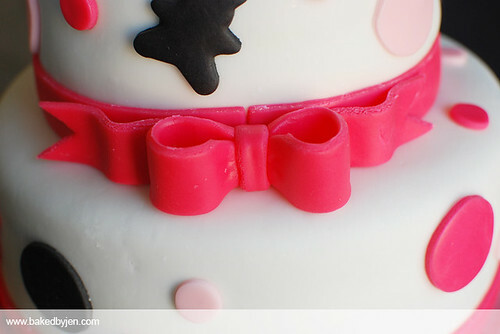 By adding a bow to the cake, I turned it from simple to chic! This cake was made from the extra chocolate cake layers and peanut butter frosting I had saved in the freezer from the Hello Kitty Baby Shower cake I made the other week. I sampled some of the trimmings when I was reshaping the cake and I swear it seemed more moist than the first time around. When I freeze my cake layers, I triple wrap it in saran wrap and then place in it a Ziploc bag. 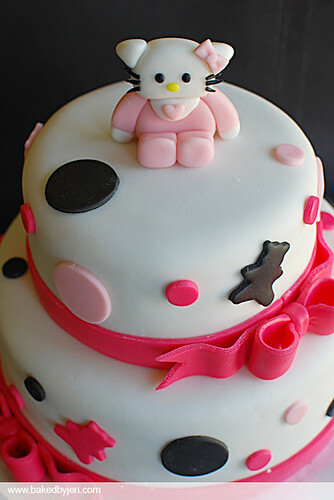 The cakes can be frozen for up to two months without losing its flavor. When I need to use it, depending on whether I'm carving or not, I'll thaw it slightly or completely before use. Cake4Kids held a Yard Sale / Bake sale yesterday to raise funds to officially file for non profit status and it was a great success! We exceeded our goals for the day! 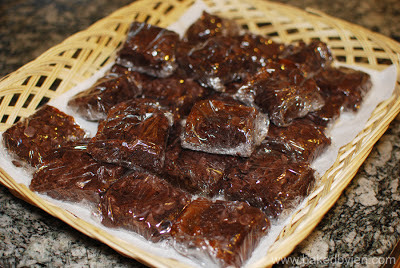 I used the opportunity to make the caramel filled brownies I saw on Buns In My Oven, which was Brady's Baking guest post, for the event. I figured the bars would be perfect being easy to individually package for selling. I followed the recipe exactly with the exception of not adding the nuts as I didn't want to leave people with nut allgeries feeling left out of enjoying such goodness. If I was making this for myself, I'd add the nuts; hence the recipe is posted with nuts. Also, these brownies do not take well to cutting into instantly! I started cutting into it the night I made them but it got messy as you can see from my first picture. After letting it sit in an air tight container overnight, I was able to make clean cuts. Unfortunately, I was trying to rush off to the bake sale; so, I didn't get any decent pictures. Definitely making another batch soon! Preheat oven to 350 degrees F. Place pecans on a cookie sheet and toast for 7-9 minutes or until golden brown and aromatic. Let cool and coarsely chop. Line a 13×9 inch pan with foil or parchment paper and grease with butter or cooking spray. 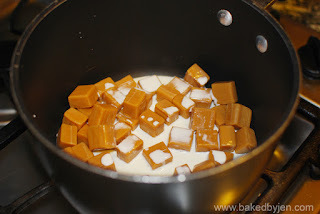 Make sure to get the sides of the pan really well so the caramel won’t stick. 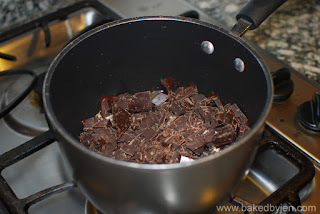 Place chocolate and butter in a medium saucepan and set over very low heat. 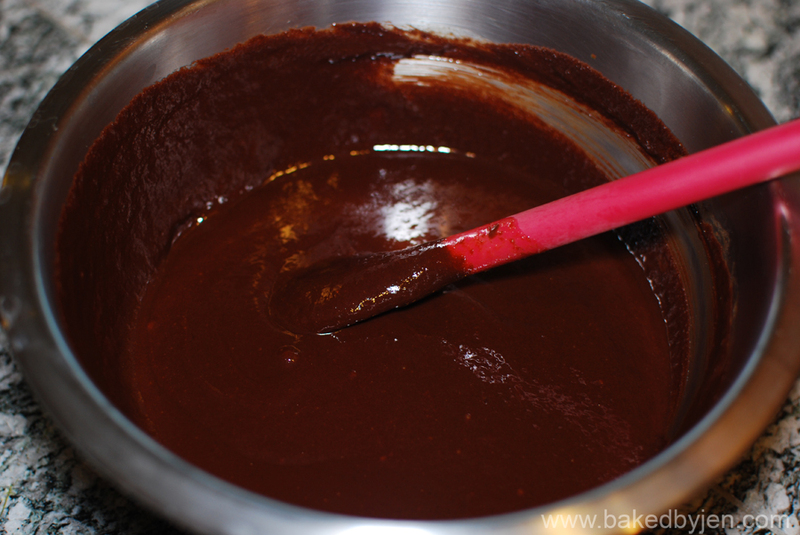 Stir gently until chocolate is melted and smooth. Transfer the chocolate mixture into a large mixing bowl and let it cool for 5 minutes. 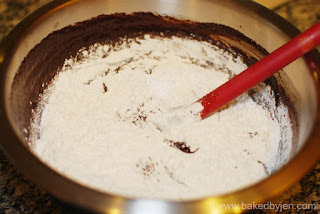 Add sugar, eggs and vanilla; mix for about 2 minutes with a whisk until batter is thick and glossy. Gently stir in flour and salt. Pour half of this batter (about 2 1/2 cups) into the lined pan and bake for 20 minutes. 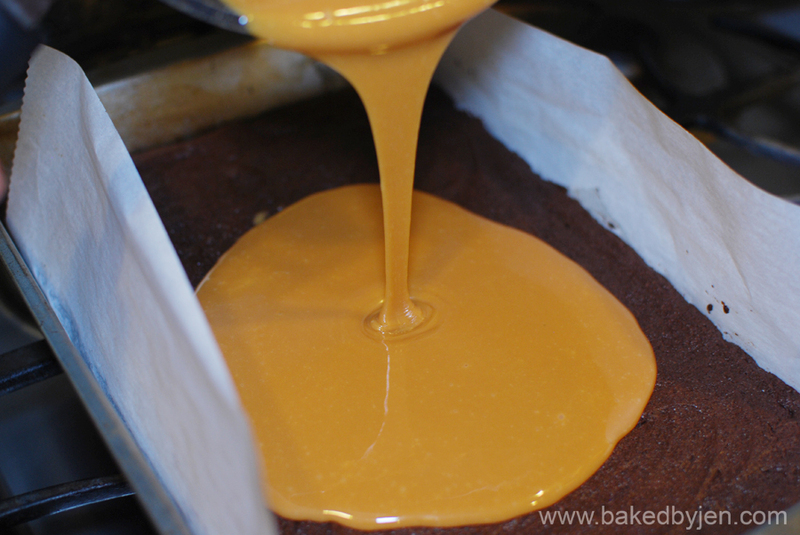 Cool for about 20 minutes while you prepare the caramel layer. Add the caramels and cream to a medium saucepan, set on low heat and stir until caramels are melted and smooth. Stir half of the chopped pecans into the caramel. Pour the caramel mixture over the baked brownie layer and spread evenly. Spread the remaining brownie batter over the caramel filling. 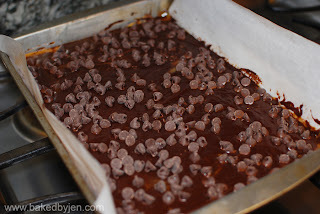 Sprinkle the chocolate chips and remaining nuts on top of the brownie batter. 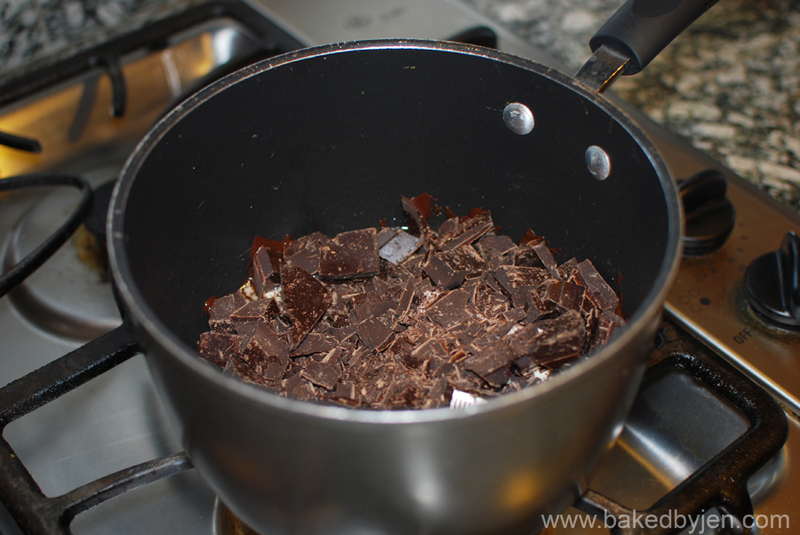 Bake at 350 degrees for another 20 minutes or until the top batter appears set but not dry. Allow brownies to cool completely; this will take several hours (or overnight). 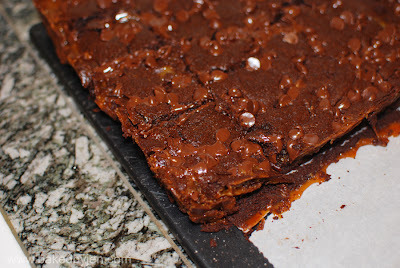 Lift brownies from pan, removepaper , and cut brownies into squares for serving. 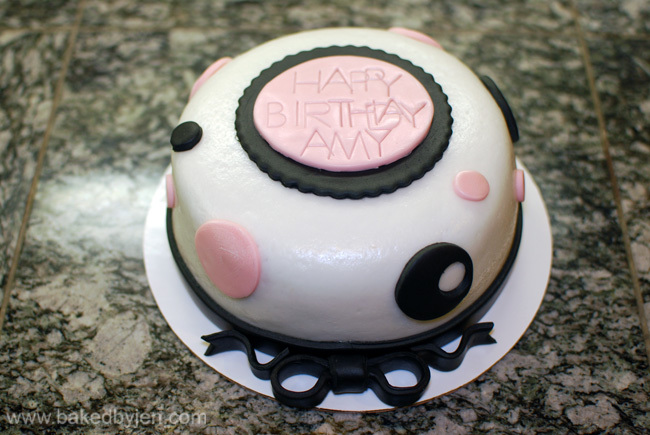 Finally got back into the kitchen to make another fondant cake. I can't believe an entire month has passed since I made the Nikon Cake. 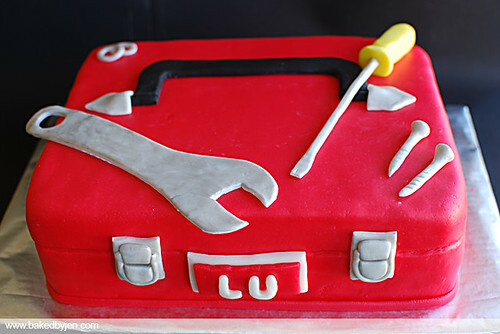 My cousin requested this cake for her husband's birthday. She didn't have any ideas on what she wanted for him; so I suggested a tool box as he is a mechanic and she let me run with it. I baked four 8x8-inch vanilla cake layers (adapted from Baking Illustrated) and ended up just using 2 and 1/2 cake layers. After I filled the cake with kahlua mousse filling, frosted the cake with vanilla buttercream frosting, and covered the cakes with marshmallow fondant, I realized that it looked a lot like a suitcase. I should've trimmed a bit off from the front! Speaking of the front, I personalized it by replacing where the brand name Craftsman would've been with the recipient's name. I made the screwdriver with my amazing new tool, the clay extruder; no more uneven ropes! Also, for black and red fondant pieces, I have been staying away from dying my marshmallow fondant and have been using store bought fondant instead but I recently purchased some Americolor Soft Gels Paste and it did not disappoint with how vibrant it made my fondant. 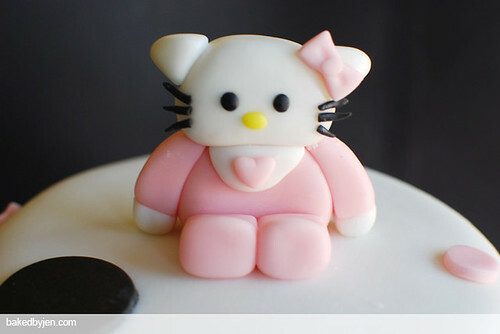 Good thing as I'm having better luck working with marshmallow fondant than store bought fondant lately. All the gray pieces was white fondant covered with silver luster dust.